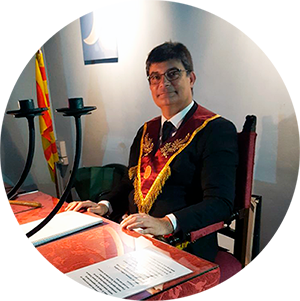 On my behalf and that of the Grand Orient of Catalonia (Catalan federation of mixed, liberal and adogmatic Universal Freemasonry, founded in 1989), I’m honored to welcome you to this website. You will also find information about the hotel where those events will take place, as well as about different hotels and apartments close to it. We have also prepared, for companion people, a program of cultural visits that you will be able to consult in this site, so that you can book them if you feel like. I hope this site will be helpful in order to make your stay in our city as pleasant and brotherly as possible. Please receive, Sistren and Brethren, the Triple Accolade and the Kiss of Peace.